Ah, fire cheese. It’s how my 2 year-old nephew refers to all forms of delicious melted cheese, whether he finds it in quesadillas, on pizza or in this case, a grilled cheese sandwich. This here recipe isn’t much of a recipe. Rather it’s some weeknight inspiration for getting food onto the table – quick! We made 2 versions tonight: one with apple and sharp cheddar; the other with tomatoes, spinach, fresh basil and parmesan. Both were devoured. Haul out the under-used waffle iron and set it to medium heat. Meanwhile, assemble your sandwiches. If using butter or margarine, lightly spread on the outside of the bread. 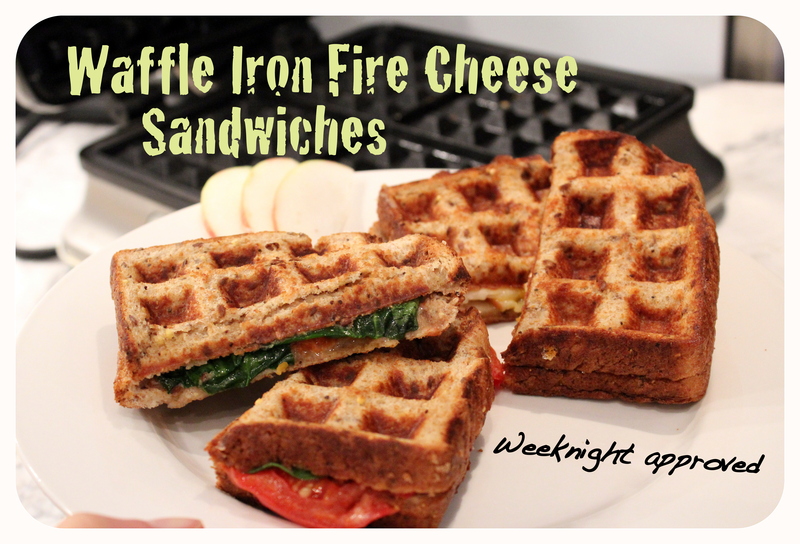 Place your sandwiches in the waffle iron and squeeze the lid shut. Let cook until the top and bottom of your grilled cheese is golden and crispy, about 3 minutes. Thanks to my fave magazine, Real Simple, for providing the inspiration. I can’t wait to re-purpose my other rarely-used kitchen appliances.